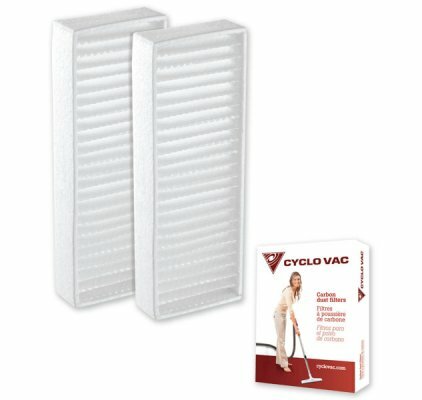 Box of 2 carbon dust filters for Cyclo Vac central vacuum. Designed for our innovative High Efficiency series, our carbon dust filter, unique world wide, captures the fine black dust produced by the motor, which would normally be deposited on surfaces surrounding the central vacuum unit. For all models except: GS95, GS115, GS135, H215, H615 and HX615.